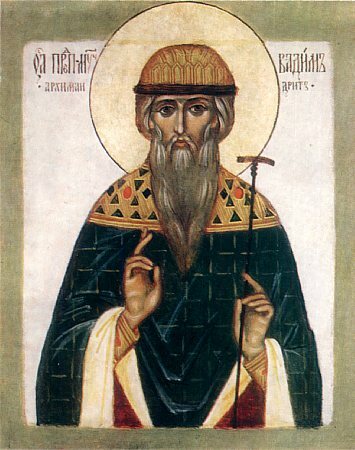 The Holy MonkMartyr Vadim the Archimandrite was born in the IV Century in the Persian city of Bythlapata, and was descended from a rich and illustrious family. In his youthful years he was enlightened with the Christian teaching. The saint gave away part of his substance and withdrew into the wilderness, where on his means he founded a monastery. For solitary prayer he would go up on a mountain, and once was vouchsafed to behold the Glory of God. During this period the Persian emperor Sapor (310-381) began to persecute Christians. They arrested Saint Vadim together with his seven disciples and daily they tortured them in the prison, seeking to have them renounce Christ and instead worship the sun and fire. But the Monk Vadim and his disciples held firmly to their Christian faith. The confessors spent four months locked up. All this time Saint Vadim was a spiritual leader and support for the Christians living in Persia. One of the associates of the emperor Sapor, Nirsanes, having confessed Christianity and suffering imprisonment for this, did not hold up under torture and recanted from Christ. He promised to fulfill whatever might be the orders of the emperor. Sapor demanded of Nirsanes, that he personally should chop off the head of Saint Vadim. For this he was promised a reprieve and rewards. Nirsanes was not able to overcome in himself the fear of new tortures and he agreed to enter upon the path of betrayal walked by Judas. When they brought Saint Vadim to him, he took the sword and turned towards him, but overcome by conscience, he trembled and stood petrified. Saint Vadim said to him: "Is thine misdeed, Nirsanes, now come to this, that thou shouldst not only renounce God, but also begin to murder His servants? Woe to thee, accursed one, what wilt thou do on that day, when thou standest before the Dread Judgement-Seat to give answer to God? It is with joy that I die a martyr for Christ, but I want not to accept death at thy hand". Beside himself, Nirsanes struck with the sword. But his hands shook, and he could not again strike at the head of the saint, and the fire-worshippers began to call him a coward. The MonkMartyr Vadim stood motionless, enduring the terrible blows, until the murderer succeeded in cutting off his head (+ 376). The just rewards for apostasy were not slow to overtake the hapless fellow: torn by conscience, he did away with himself, having thrown himself on a sword. After the death of the emperor Sapor, the seven disciples of the MonkMartyr Vadim were released from prison.